Remember the Watts et al. manuscript in 2012? Anthony Watts putting his blog on hold to urgently finish his draft? This study is now a poster at the AGU conference and Watts promises to submit it soon to an undisclosed journal. On first sight, the study now has a higher technical quality and some problems have been solved. The two key weakness are, however, not discussed in the press release to the poster. This is strange. I have had long discussions with second author Evan Jones about this. Scientists (real sceptics) have to be critical about their own work. 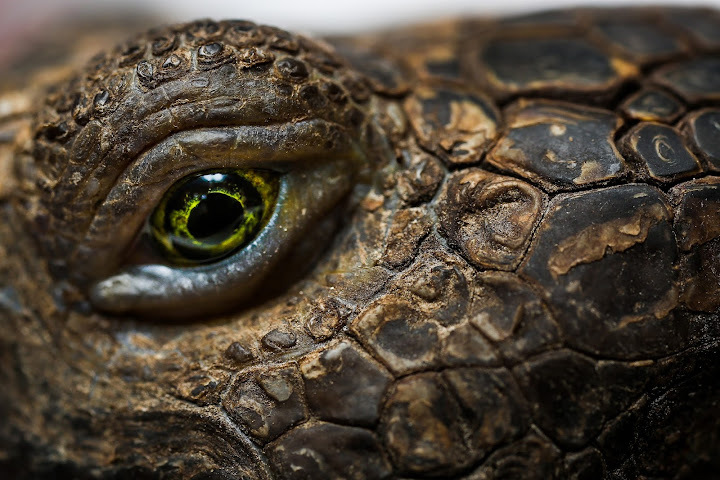 You would expect a scientist to focus a large part of a study on any weaknesses, if possible try to show they probably do not matter or else at least honestly confront the weaknesses, rather than simply ignore them. Watts et al. is about the immediate surrounding, also called micro-siting, of weather stations that measure the surface air temperature. 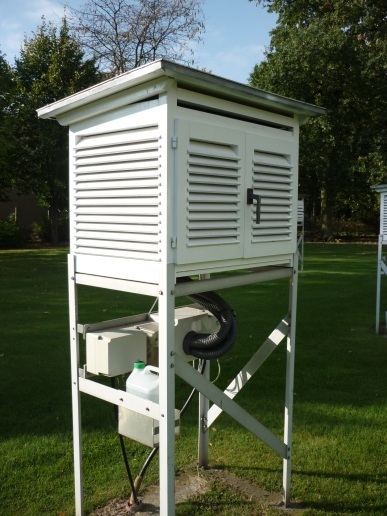 The American weather stations have been assessed for their quality in five categories by volunteers of the blog WUWT. Watts and colleagues call the two best categories "compliant" and the three worst ones "non-compliant". For these two categories they then compare the average temperature signal for the 30-year period 1979 – 2008. An important problem of the 2012 version of this study was that historical records typically also contain temperature changes because the method of observation has changed. An important change in the USA is the time of observation bias. In the past observations were more often made in the afternoon than in the morning. Morning measurements results in somewhat lower temperatures. This change in the time of observation creates a bias of about 0.2°C per century and was ignored in the 2012 study. Also the auditor, Steve McIntyre, who was then a co-author admitted this was an error. This problem is now fixed; stations with a change in the time of observation have been removed from the study. Another important observational change in the USA is the change of the screen used to protect the thermometer from the sun. In the past, so-called Cotton Region Shelters (CRS) or Stevenson screens were used, nowadays more and more automatic weather stations (AWS) are used. A much used type of AWS in the USA is the MMTS. America was one of the first countries to automatize its network, with then analogue equipment that did not allow for long cables between the sensor and the display, which is installed inside a building. Furthermore, the technicians only had one day per station and as a consequence many of the MMTS systems were badly sited. Although they are badly sited, these MMTS system typically measure 0.2°C 0.15°C cooler temperatures. The size of the cooling has been estimated by comparing a station with such a change with a neighbouring station where nothing happens. Because both stations experience about the same weather, the difference signal shows the jump in the mean temperature more clearly. Weakness 1 is that the authors only know the siting quality at the end of the period. Stations in the compliant categories may have been in less well sited earlier on, while stations in the non-compliant categories may have been better sited before. Someone has a weather station in a parking lot. Noticing their error, they move the station to a field, creating a great big cooling-bias inhomogeneity. Watts comes along, and seeing the station correctly set up says: this station is sited correctly, and therefore the raw data will provide a reliable trend estimate. The study tries to reduce this problem by creating a subset of stations that is unperturbed by Time of Observation changes, station moves, or rating changes. At least according to the station history (metadata). The problem is that metadata is never perfect. The scientists working on homogenization thus advise to always also detect changes in the observational methods (inhomogeneities) by comparing a station to its neighbours. I have told Evan Jones how important this is, but they refuse to use homogenization methods because they feel homogenization does not work. In a scientific paper, they will have to provide evidence to explain why they reject an established method that could ameliorate a serious problem with their study. The irony is that the MMTS adjustments, which the Watts et al. study does use, depend on the same principle. Weakness 2 is that the result is purely statistical and that no physical explanation is provided for the result. It is clear that bad micro-siting will lead to a temperature bias, but this does not affect the trend, while the study shows a difference in trend. I would not know how bad or good constant siting quality would change a trend. The press release also does not offer an explanation. What makes this trend difference even more mysterious, if it were real, is that it mainly happens in the 1980s and 1990s, but has stopped in the last decade. See the graph below showing the trend for compliant (blue) and non-compliant stations (orange). While I am unable to see a natural explanation for the trend difference, that the difference is mainly seen in the first two decades fits to the hypothesis that the siting quality of the compliant stations was worse in the past: that in the past these stations were less compliant and a little too warm. The further you go back in time, the more likely it becomes that some change has happened. And the further you go back in time, the more likely it is that this change is no longer known. Below I have quoted the six key findings of Watts et al. (2015) according to the press release. The temperature network in the USA has on average one detectable break every 15 years (and a few more breaks that are too small to be detected, but can still influence the result). The 30-year period studied should thus contain on average 2 breaks and likely only 12.6% of the stations do not have a break (154 stations). According to Watts et al. 410 of 1218 stations have no break. 256 stations (more than half their "unperturbed" dataset) thus likely have a break that Watts et al. did not find. That the "perturbed" stations have a smaller trend than the "unperturbed" stations confirms what we know: that in the USA the inhomogeneities have a cooling bias. 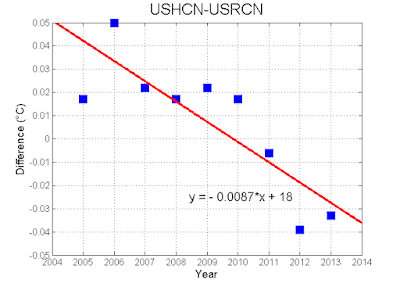 In the "raw" data the "unperturbed" subset has a trend in the mean temperature of 0.204°C per decade; see table below. In the "perturbed" subset the trend is only 0.126°C per decade. That is a whooping cooling difference of 0.2°C over this period. The stronger trend difference for the minimum temperature would also need an explanation. 3. 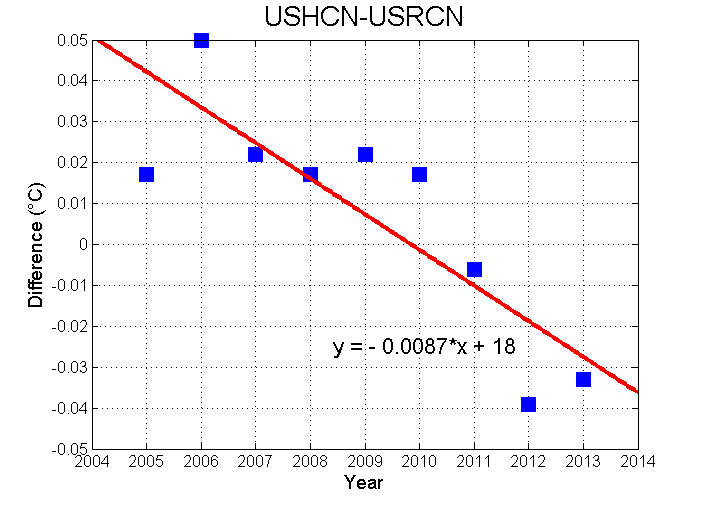 Equipment bias (CRS [Cotton Region Shelter] v. MMTS [Automatic Weather station] stations) in the unperturbed subset of USHCN stations has a significant effect on the mean temperature (Tmean) trend when CRS stations are compared with MMTS stations. MMTS stations show significantly less warming than CRS stations from 1979 – 2008. 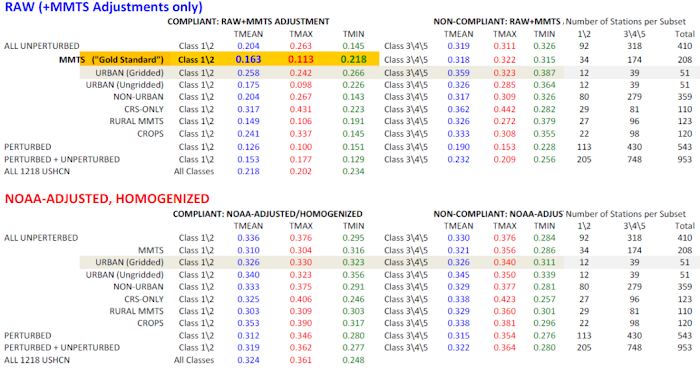 (Table 1 [shown above]) These differences are significant in Tmean (even after upward adjustment for MMTS conversion) and most pronounced in the maximum temperature data (Tmax). The trend for the stations that use a Cotton Region Shelter is 0.3°C per decade. That is large and should be studied. This was the typical shelter in the past. Thus we can be quite sure that in these cases the shelter did not change, but there could naturally have been other changes. It is natural that the trend in the raw data is smaller than the trend in the adjusted data. 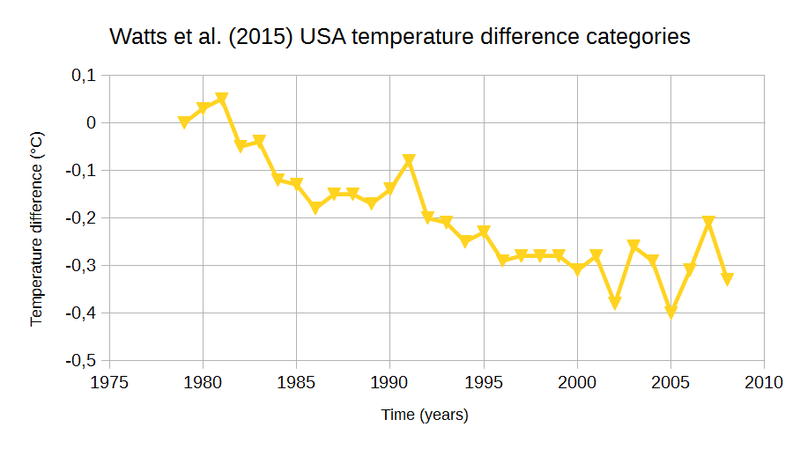 Mainly for the above mentioned reasons (TOBS and MMTS) the biases in the USA are large compared to the rest of the world and the trend in the USA is adjusted 0.4°C per century upwards. Well, they already wrote "we believe". There is no evidence for this claim. The year to year variations in a single station series is about 1°C. I am not sure whether one would see whether the inhomogeneity is one or more step changes or a gradual change. If I were reviewer of this manuscript, I would ask about some choices that seem arbitrary and I would like to know whether they matter. For example using the period 1979 – 2008 and not continuing the data to 2015. It is fine to also show data until 2008 for better comparisons with earlier papers, but stopping 7 years earlier is suspicious. Also the choice to drop stations with TOBS changes, but to correct stations with MMTS changes sounds strange. It would be of interest whether any of the other 3 options show different results. Anomalies should be computed over a period, not relative to the starting year. Oh, a shout-out to Dr. Venema, one of the earlier critics of Watts et al. (2012) who pointed out to us things that needed to be accounted for, such as TOBS, a stricter hand on station moves, and MMTS equipment conversion. Note to Anthony: In terms of reasonable discussion, VV is way up there. He actually has helped to point us in a better direction. I think both Victor Venema and William Connolley should get a hat-tip in the paper (if they would accept it!) because their well considered criticism was of such great help to us over the months since the 2012 release. It was just the way science is supposed to be, like you read about in books. Even input from openly hostile professional people, such as Victor Venema, have been highly useful, and I thank him for it. Glad to have been of help. I do not recall having been "openly hostile" to this study. It would be hard to come to a positive judgement of the quality of the blog posts at WUWT, whether they are from the pathological misquoter Monckton or greenhouse effect denier Tim Ball. However, it is always great when people contribute to the scientific literature. When the quality of their work meets the scientific standard, it does not matter what their motivation is, then science can learn something. The surface stations project is useful to learn more about the quality of the measurements; also for trend studies if continued over the coming decades. Abstract. Climate observations are affected by variations in land use and land cover at all scales, including the microscale. A 410-station subset of U.S. Historical Climatology Network (version 2.5) stations is identified that experienced no changes in time of observation or station moves during the 1979-2008 period. These stations are classified based on proximity to artificial surfaces, buildings, and other such objects with unnatural thermal mass using guidelines established by Leroy (2010). 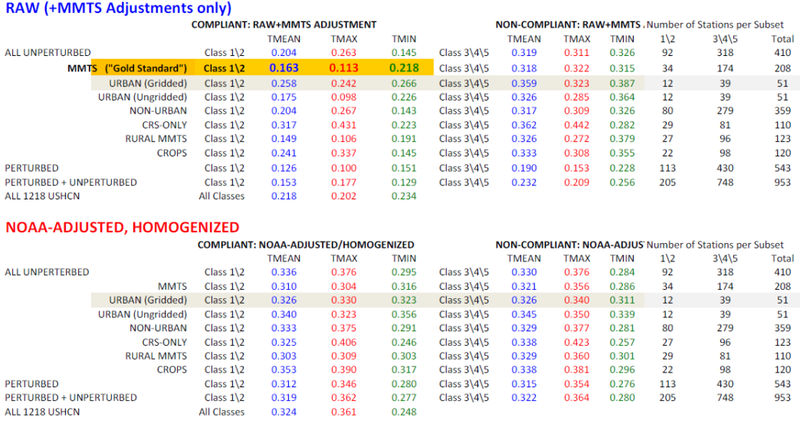 The relatively few stations in the classes with minimal artificial impact are found to have raw temperature trends that are collectively about 2/3 as large as stations in the classes with greater expected artificial impact. The trend differences are largest for minimum temperatures and are statistically significant even at the regional scale and across different types of instrumentation and degrees of urbanization. The homogeneity adjustments applied by the National Centers for Environmental Information (formerly the National Climatic Data Center) greatly reduce those differences but produce trends that are more consistent with the stations with greater expected artificial impact. Trend differences between the Cooperative Observer Network and the Climate Reference Network are not found during the 2005-2014 sub-period of relatively stable temperatures, suggesting that the observed differences are caused by a physical mechanism that is directly or indirectly caused by changing temperatures. This Monday the Fall Meeting of the American Geophysical Union (AGU2015) starts. An important function of conferences is knowing who is working on what. Browsing the program does a lot of that, even if you are not there. Here is an overview of where I would have had a look from my interest in climate data quality. Links, emphasis and [explanations] are mine. The titles are linked to the AGU abstracts, where you can also mail, tweet or facebook the abstracts to others who may be interested. Extract abstract. We are using thermal infrared satellite data in conjunction with in situ measurements to produce water temperatures for all the large inland water bodies in North America and the rest of the world for potential use as climate indicator. Recent studies have revealed significant warming of inland waters throughout the world. The observed rate of warming is – in many cases – greater than that of the ambient air temperature. These rapid, unprecedented changes in inland water temperatures have profound implications for lake hydrodynamics, productivity, and biotic communities. Scientists are just beginning to understand the global extent, regional patterns, physical mechanisms, and ecological consequences of lake warming. See also my previous post on the fast warming of rivers and lakes and the decrease in their freezing periods. Unfortunately the abstract does not say much about the "hiatus" mentioned in the title. There is also a detailed study on the relationship between air and water temperature for Lake Tahoe. abstract. Incomplete and non-uniform observational coverage of the globe is a prominent source of uncertainty in instrumental records of global near-surface temperature change. In this study the capabilities of a range of statistical analysis methods are assessed in producing improved estimates of global near-surface temperature change since the mid 19th century for observational coverage in the HadCRUT4 data set. Methods used include those that interpolate according to local correlation structure (kriging) and reduced space methods that learn large-scale temperature patterns. The performance of each method in estimating regional and global temperature changes has been benchmarked in application to a subset of CMIP5 simulations. Model fields are sub-sampled and simulated observational errors added to emulate observational data, permitting assessment of temperature field reconstruction algorithms in controlled tests in which globally complete temperature fields are known. The reconstruction methods have also been applied to the HadCRUT4 data set, yielding a range of estimates of global near-surface temperature change since the mid 19th century. Results show relatively increased warming in the global average over the 21st century owing to reconstruction of temperatures in high northern latitudes, supporting the findings of Cowtan & Way (2014) and Karl et al. (2015). While there is broad agreement between estimates of global and hemispheric changes throughout much of the 20th and 21st century, agreement is reduced in the 19th and early 20th century. This finding is supported by the climate model trials that highlight uncertainty in reconstructing data sparse regions, most notably in the Southern Hemisphere in the 19th century. These results underline the importance of continued data rescue activities, such as those of the International Surface Temperature Initiative and ACRE. At first sight you may think my colleagues have gone crazy. A daily spatially complete global centennial high-resolution temperature dataset! I would be so happy if we could get halfway reliable estimates of changes in weather variability and extremes from some high-quality, high-density station networks for the recent decades. It is really hard to detect and remove changes in variability due to changes in the monitoring practices and these changes are most likely huge. However, if you read carefully, they only promise to make the dataset and do not promise that the data is fit for any specific use. One of the main ways mitigation sceptics misinform the public is by pretending that datasets provide reliable information for any application. In reality the reliability of a feature needs to be studied first. Let's be optimistic and see how far they will get; they just started, have a nice bag of tricks and mathematical prowess. Day-to-day variations in surface air temperature affect society in many ways; however, daily surface air temperature measurements are not available everywhere. A global daily analysis cannot be achieved with measurements made in situ alone, so incorporation of satellite retrievals is needed. To achieve this, we must develop an understanding of the relationships between traditional (land and marine) surface air temperature measurements and retrievals of surface skin temperature from satellite measurements, i.e. Land Surface Temperature, Ice Surface Temperature, Sea Surface Temperature and Lake Surface Water Temperature. These relationships can be derived either empirically or with the help of a physical model. A separate poster will provide more details on the satellite data. The Initiative is a multi-disciplinary effort to improve our observational understanding of all relevant aspects of land surface air temperatures from the global-mean centennial scale trends to local information relevant for climate services and climate smart decisions. The initiative was started in 2010 with a meeting that set the overall remit and direction. In the intervening 5 years much progress has been made, although much remains to be done. This talk shall highlight: the over-arching initiative framework, some of the achievements and major outcomes to date, as well as opportunities to get involved. It shall also highlight the many challenges yet to be addressed as we move from questions of global long-term trends to more local and regional data requirements to meet emerging scientific and societal needs. Sherwood and colleagues have generated a new radiosonde dataset, removing artificial instrumental changes as well as they could. They find that the tropical hotspot does exist, that the models predictions of this tropic hotspot in the tropical tropospheric trends thus fit. They find that the recent tropospheric trend is not smaller than before. I hope there is no Australian Lamar Smith who needs an "hiatus" and is willing to harass scientists for political gain. That there is not even a non-significant change from the long-term warming trend is surprising because of the recently more frequent cooling El Nino Southern Oscillation (ENSO) phases (La Nina phases). One would expect to see the influence of ENSO even stronger in the tropospheric temperatures than in the 2-m temperature. This makes it more likely that this insignificant trend change in the 2-m temperature is a measurement artefact. Wind trends over the period 1979–2012 confirm a strengthening, lifting and poleward shift of both subtropical westerly jets; the Northern one shows more displacement and the southern more intensification, but these details appear sensitive to the time period analysed. Winds over the Southern Ocean have intensified with a downward extension from the stratosphere to troposphere visible from austral summer through autumn. There is also a trend toward more easterly winds in the middle and upper troposphere of the deep tropics, which may be associated with tropical expansion. This talk presents an uncertainty analysis of known errors in tropospheric satellite temperature changes and an ensemble of possible estimates that makes computing uncertainties for a specific application easier. The temperature of the Earth’s atmosphere has been continuously observed by satellite-borne microwave sounders since late 1978. These measurements, made by the Microwave Sounding Units (MSUs) and the Advanced Microwave Sounding Units (AMSUs) yield one of the longest truly global records of Earth’s climate. To be useful for climate studies, measurements made by different satellites and satellite systems need to be merged into a single long-term dataset. Before and during the merging process, a number of adjustments made to the satellite measurements. These adjustments are intended to account for issues such as calibration drifts or changes in local measurement time. Because the adjustments are made with imperfect knowledge, they are therefore not likely to reduce errors to zero, and thus introduce uncertainty into the resulting long-term data record. In this presentation, we will discuss a Monte-Carlo-based approach to calculating and describing the effects of these uncertainty sources on the final merged dataset. The result of our uncertainty analysis is an ensemble of possible datasets, with the applied adjustments varied within reasonable bounds, and other error sources such as sampling noise taken into account. The ensemble approach makes it easy for the user community to assess the effects of uncertainty on their work by simply repeating their analysis for each ensemble member. Recently, a new generation of so-called climate reanalyses has emerged, including the 161-year NOAA—Cooperative Institute for Research in Environmental Sciences (NOAA-CIRES) Twentieth Century Reanalysis Version 2c (20CR V2c), the 111-year ECMWF pilot reanalysis of the twentieth century (ERA-20C), and the 55-year JMA conventional reanalysis (JRA-55C). These reanalyses were explicitly designed to achieve improved homogeneity through assimilation of a fixed subset of (mostly surface) observations. We apply structural breakpoint analysis to evaluate inhomogeneity of the surface air temperature in these reanalyses (1851-2011). For the modern satellite era (1979-2013), we intercompare their inhomogeneity to that of all eleven available satellite reanalyses. Where possible, we distinguish between breakpoints that are likely linked to climate variability and those that are likely due to an artificial observational network shift. ERA-20C is found to be the most homogeneous reanalysis, with 40% fewer artificial breaks than 20CR V2c. Despite its gains in homogeneity, continued improvements to ERA-20C are needed. In this presentation, we highlight the most spatially extensive artificial break events in ERA-20C. There is also a more detailed talk about the quality of humidity in reanalysis over China. In session: Evaluating Reanalysis: What Can We Learn about Past Weather and Climate? ...The monthly totals of the ERA-20C reanalysis are compared to two corresponding Global Precipitation Climatology Centre (GPCC) products; the Full Data Reanalysis Version 7 and the new HOMogenized PRecipitation Analysis of European in-situ data (HOMPRA Europe). ERA-20C...covers the time period 1900 to 2010. Only surface observations are assimilated namely marine winds and pressure. This allows the comparison with independent, not assimilated data. Sounds interesting, the abstract unfortunately does not give much results yet. The cyclonecenter.org project started in fall 2012 and has been collecting citizen scientist volunteer tropical cyclone intensity estimates ever since. The project is hosted by the Citizen Science Alliance (zooniverse) and the platform is supported by a range of scientists. We have over 30 years of satellite imagery of tropical cyclones but the analysis to date has been done on an ocean-basin by ocean-basin basis and worse still practices have changed over time. We therefore do not, presently, have a homogeneous record relevant for discerning climatic changes. Automated techniques can classify many of the images but have a propensity to be challenged during storm transitions. The problem is fundamentally one where many pairs of eyes are invaluable as there is no substitute for human eyes in discerning patterns. Each image is classified by ten unique users before it is retired. This provides a unique insight into the uncertainty inherent in classification. In the three years of the project much useful data has accrued. This presentation shall highlight some of the results and analyses to date and touch on insights as to what has worked and what perhaps has not worked so well. There are still many images left to complete so its far from too late to jump over to www.cyclonecenter.org and help out. ...Contextual information needed to effectively utilize the data is sparse. Examples of such contextual information include ground truth data for land cover classification, presence/absence of species, prevalence of mosquito breeding sites and characteristics of urban land cover. Often, there are no agencies tasked with routine collection of such contextual information, which could be effectively collected through crowdsourcing. There is also a crowd sourced project for Land use and land cover for (urban) climatology: the World Urban Database. A great initiative. Great to see NOAA make first steps towards homogenization of their large daily data collection, a huge and important task. Note that the daily data is only adjusted for changes in the monthly means. This is an improvement, but for the weather extremes, the topic of this session, also the rest of the marginal distribution needs to be homogenized. We present homogenization procedure and results for Germany’s historical radiosonde [(RS)] records, dating back to the 1950s. Our manual homogenization makes use of the different RS networks existing in East and West-Germany from the 1950s until 1990. The largest temperature adjustments, up to 2.5K, are applied to Freiberg sondes used in the East in the 1950s and 1960s. Adjustments for Graw H50 and M60 sondes, used in the West from the 1950s to the late 1980s, and for RKZ sondes, used in the East in the 1970s and 1980s, are also significant, 0.3 to 0.5K. Small differences between Vaisala RS80 and RS92 sondes used throughout Germany since 1990 and 2005, respectively, were not corrected for at levels from the ground to 300 hPa. Comparison of the homogenized data with other radiosonde datasets, RICH (Haimberger et al., 2012) and HadAT2 (McCarthy et al., 2008), and with Microwave Sounding Unit satellite data (Mears and Wentz, 2009), shows generally good agreement. HadAT2 data exhibit a few suspicious spikes in the 1970s and 1980s, and some suspicious offsets up to 1K after 1995. Compared to RICH, our homogenized data show slightly different temperatures in the 1960s and 1970s. We find that the troposphere over Germany has been warming by 0.25 ± 0.1K per decade since the early 1960s, slightly more than reported in other studies (Hartmann et al., 2013). The stratosphere has been cooling, with the trend increasing from almost no change near 230hPa (the tropopause) to -0.5 ± 0.2K per decade near 50hPa. Trends from the homogenized data are more positive by about 0.1K per decade compared to the original data, both in troposphere and stratosphere. Statistical relative homogenization can only partially remove trend biases. Given that the trend needed to be corrected upwards, the real temperature trend may thus be larger. We find that variability of daily temperatures, as measured by the difference between the 95th and 5th percentiles, has decreased markedly in winter for both daily minima and maxima. ... The reduced spread of winter temperatures primarily results from Arctic amplification decreasing the meridional temperature gradient. Greater observed warming in the 5th relative to the 95th percentile stems from asymmetric effects of advection [air movements] during cold versus warm days; cold air advection is generally from northerly regions that have experienced greater warming than western or southwestern regions that are generally sourced during warm days. Studies on changes in variability are the best. Guest appearances of the Arctic polar vortex in the eastern USA had given me the impression that the variability had increased, not decreased. Interesting. The standard deviation (STD) variability in long historical temperature records in Europe is analyzed. It is found that STD is changeable with time, and a century-scale variation is revealed, which further indicates a century-scale intensity modulation of the large-scale temperature variability. Studies on changes in variability are the best. This intriguing osculation in the standard deviation of temperature was found before for the Greater Alpine Region by Reinhard Böhm. He also found it in precipitation and pressure (with a little fantasy). One be careful with such studies, changes in the standard deviation due to changes in monitoring practises (inhomogeneities) are mostly not detected, nor corrected. Only a few national and regional daily datasets have been (partially) homogenized in this respect. It is quite sure that I missed relevant presentations. Please add them in the comments. People often see uncertainty as a failing of science. It's the opposite: uncertainty is what drives science forward. Imagine you are driving on a curvy forest road and it gets more foggy. Do you slow down or do you keep your foot on the pedal? More fog means more uncertainty, means less predictability, means that you see the deer in your headlights later. Climate change mitigations sceptics like talking about uncertainty. They seem to see this as a reason to keep the foot op the pedal. While this is madness, psychology suggests that this is an effective political strategy. When you talk about uncertainty people have a tendency to become less decisive. Maybe people want to wait deciding until the situation is clearer? That is exactly what the advocates for inaction want and neglects that deciding not to start solving the problem is also a decision. For someone who would like to see all of humanity prosper deciding not to act is a bad counter-productive decision. Maybe people do not realise that uncertainty can have multiple meanings. In case of climate change "uncertainty" does not mean that scientists are not sure. Science is very sure it is warming, that this is due to us and that it will continue if we do not do anything. When we talk about climate change, "uncertainty" means that we do not know exactly how much it has warmed. It means that the best estimate of the man made contribution is "basically all", but that it is possible that it is more or that it is less. It means that we know it will warm a lot the coming century, but not exactly how much, if only because no one knows whether humanity gets it act together. It means that the seas will rise more than one meter, but that we can only give a period in which this threshold will be crossed. Rather than talking about "uncertainty" I try to talk about "confidence intervals" nowadays, that conveys the idea of this latter kind of uncertainty much better. Science may not know the exact value, but the value will most likely be in the confidence interval. That the term uncertainty can be misunderstood is especially a problem because scientists love to talk about uncertainties. A value is worth nothing if you do not have an idea how accurate it is. Thus most of the time scientists work on making sure that the uncertainties are accurate and as small as possible. The damages of climate change rise with its magnitude (let's call this "temperature increase" for simplicity). I will argue in the next section that these damages rise faster than linear. If the relationship were linear, twice as much temperature increase would mean twice as much damages. Super-linear means that damages rise faster than that. Let us for this post assume that the damages are proportional to the square of the temperature increase. Any other super-linear relationship would show the same effect: that more uncertainty means higher risks. In this case, if there were no uncertainty and the temperature in 2100 will increase by 4 degrees Celsius. For comparison, the temperature increase in 2100 is projected to be between 3 and 5.5°C for the worst scenario considered by the IPCC; RCP8.5. With 4 degrees warming the damages would be 16*D (42*D) dollar or 16*H human lives. In the case with uncertainty, the temperature in 2100 would still increase by 4 degrees on average, but it could also be 3°C or 5°C. The damages for 4 degrees are still 16*D dollar. At 3 degrees the damage would be 9*D and at 5 degrees 25*D dollar, which is on average 17*D. The total damages will thus be higher than the 16*D dollar we had for the case without uncertainty. If the uncertainty becomes larger, and we also have to take 2 and 6 degrees into account we get 4*D (for 2°C) and 36*D (for 6°C), which averages to 20*D dollar. When we are less certain that the temperature increase is near 4°C and uncertainty forces us to take 2°C and 6°C into account, the average expected damages become higher. Judith Curry thinks that we should take even more uncertainty into account: "I think we can bound [equilibrium climate sensitivity] between 1 and 6°C at a likely level, I don’t think we can justify narrowing this further. ... [T]here is a 33% probability that that actual [climate] sensitivity could be higher or lower than my bounds. To bound at a 90% level, I would say the bounds need to be 0-10°C." If the climate sensitivity were zero, the damages in 2100 would be zero. Estimating the temperature increase for a climate sensitivity of 10°C is more challenging. If we would still follow the carbon-is-life scenario mitigation skeptics prefer (RCP8.5), we would get a temperature increase of around 13°C in 2100**. It seems more likely that civilization will collapse before, but 13°C would give climate change damages of 132*D, which equals 169*D. The average damages for Curry's limiting case are thus 85*D, a lot more than the 16*D for the case were we are certain. If the uncertainty monster were this big, that would make the risk of climate change a lot higher. Uncertainty is not the friend of people arguing against mitigation. The same thinking error is also made by climate change activists that sometimes ask scientists to emphasis uncertainty less. Accumulated loss of regional species richness of macro-invertebrates as a function of glacial cover in catchment. They begin to disappear from assemblages when glacial cover in the catchment drops below approximately 50%, and 9 to 14 species are predicted to be lost with the complete disappearance of glaciers in each region, corresponding to 11, 16, and 38% of the total species richness in the three study regions in Ecuador, Europe, and Alaska. Figure RF-2 from IPCC AR5 report. The above argument rests on the assumption that climate change damages rise super-linearly. If damages would rise linearly, uncertainty would not matter for the risk. In theory, if damages would rise less fast than linear (sub-linear), the risk would become lower with more uncertainty. I am not aware of anyone doubting that the damages are super-linear. Weather and climate are variable. Every system will thus be adjusted to a small temperature increase. On the other hand, a 10°C temperature increase will affect, if not destroy, nearly everything. Once a large part of civilization is destroyed, the damages function may become sub-linear again. Whether the temperature increase is 10 or 11 degrees Celsius likely does not matter much any more. What is a small temperature increase depends on the system. For sea level rise, the global mean temperature is important and the average temperature over centuries to millennia. This did not vary much, thus climate change quickly shows an influence. For the disappearance of permafrost, the long-term temperature is also important, but the damage to the infrastructure build on them depend on the local temperature, which varies more than the global temperature. On the local annual scale the variability is about 1°C, which is the global warming we have seen up to now and where new effects are now seen, for example nature moving poleward and up mountains (if it can). In summary, the more temperature increases, the more systems notice the change and naturally the more they are affected. Damages can be avoided by adaptation. Both natural adaptation to the vagaries of weather and climate, as well as man-made adaptation in anticipation of the mess we are getting into. In the beginning there will still be low-hanging fruit, but the larger the changes will become, the more expensive adaptation becomes. More uncertainty also makes man-made adaptation more costly. If you do not know accurately how much bigger a centennial flood is, that is costly. To build bigger flood protections you need to have a best estimate, but also need to add a few times the uncertainty to this estimate, otherwise you would still be flooded half the time such a flood comes by. An example of super-linear impacts is species loss for glacier catchments when the glaciers disappear. The figure above shows that initial small reductions in the glaciers did not impact nature much yet, but that it rises fast near the time the glacier is lost. 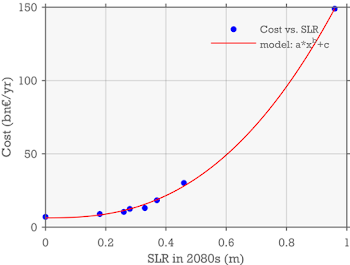 The costs of sea level rise rise super-linearly as a function of the amount of sea level rise. Data from Brown et al. (2011). 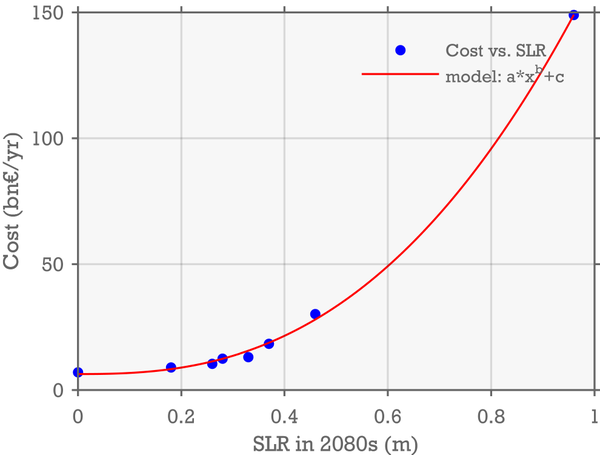 Another example are the super-linear costs of sea level rise. This plot to the right was generated by sea level rise expert Aslak Grinsted from data of a large European scientific project on the costs of climate change. He added that this shape is consistent across many studies on the costs of sea level rise. The climate change damages functions of Weitzman (2010b) and Nordhaus (2008). For a zero temperature change Ω(t)=1Ω(t)=1 (no damage) and for very large temperature changes it approaches 0 (maximum damage). Consequently, the two damages functions shown to the right differ enormously. Important for this post: they are both super-linear. If there is one thing I fear about climate change, then it is uncertainty. There will be many surprises. We are taking the climate system out of the state we know well and are perform a massive experiment with it. Things are bound to happen, we did not think of. Some might be nice, more likely the surprises will not be nice. As Judith Curry calls it: climate change is a wicked problem. Medical researchers like to study rare deceases. They do so much more than the number of patients would justify. But seeing things go wrong helps you understand how things work. The other way around this means that until things go wrong, we will often not even know we should have studied it. Some surprises will be that an impact that science did study turns out to be better or worse; the known unknowns. The most dangerous surprises are bound to be the unknown unknowns, which we never realised we would have had to study. The uncertainty monster is my main reason as citizen to want to solve this problem. Call me a conservative. The climate system is one of the traditional pillars of our society. Something you do not change without considering long and hard what the consequences will be. The climate is something you want to understand very well before you change it. If we had perfect climate and weather predictions, climate change would be a much smaller problem. I think the first thing to acknowledge is that there will be surprises. We’re moving into a regime of climate that we have not experienced as humans, most ecosystems have not experienced since the beginning of the ice age cycle some three million years ago. We don’t know very well what exactly was happening then. We know some big things, like how much the sea level rose and what the temperatures were like, but there’s a lot of things that we don’t know. And so we are anticipating “unknown unknowns”. But, of course, they’re unknown, so you don’t know what they’re going to be. One irony is that climate models reduce the uncertainty by improving the scientific understanding of the climate system. Without climate models we would still know that the Earth warms when we increase greenhouse gasses. The greenhouse effect can be directly measured by looking at the infra red radiation from the sky. When you make that bigger, it gets warmer. When you put on a second sweater, you get warmer. We know it gets warmer from simple radiative transfer computations. We know that CO2 influences temperature by studying past climates. The climate models have about the same climate sensitivity as those simple radiative transfer computations and the estimates from past climates. It could have been different because the climate is more complicated than the simple radiative transfer computation. It could have been different because the increase in greenhouse gasses goes so fast this time. That all those climate sensitivity estimates fit together reduces the uncertainty, especially the uncertainty from the unknown unknowns. Without climate models it would be very hard to estimate all the other changes in the climate system. The increases in precipitation and especially increases in severe precipitation, in floods, in droughts, in the circulation patterns, how fast sea level rise will go. Without climate models these risks would be much higher, without climate models we would have to adapt to a much wider range of changes in weather and climate. This would make adaptation a lot more intrusive and expensive. Without climate models and climate research in general the risks of changing our climate would be larger. We would need to be more careful, the case for reductions of greenhouse gas emissions would have been stronger. Especially for mitigation sceptics advocating adaptation-only policies, climate research should be important. Adaptation needs high-quality local information. For a 1000-year event such as the downpour in South Carolina earlier this year or the record precipitation this week in the UK, we may have to life with the damages. If this will happen much more often under climate change, we will have to change our infrastructure. If we do not know what is coming, we will have to prepare for everything. That is expensive. Reductions in this uncertainty save money by reducing unnecessary adaptation measures and by reducing damages due to effective adaptation. People who are against mitigation policies should be cheering for climate research, rather than try to defund it or harass scientists for their politically inconvenient message. Let's be generous and assume that they do not know what they are doing. In summary. Uncertainty makes the risk of climate change larger. Uncertainty makes adaptation a less attractive option relative to solving the problem (mitigation). The more we take the climate system out of known territories the more surprises (unknown unknowns) we can expect. In a logical world uncertainty would be the message of the environmental movement. In the real world uncertainty is one of the main fallacies of the mitigation skeptics and their "think" tanks. European Climate Adaptation Platform: How to communicate uncertainty? Botzen, W.J.W. and J.C. van den Bergh, 2012: How sensitive is Nordhaus to Weitzman? climate policy in DICE with an alternative damage function. Economics Letters, 117, pp. 372–374, doi: 10.1016/j.econlet.2012.05.032. Nordhaus, W.D., 2008: A Question of Balance: Weighing the Options on Global Warming Policies. Yale University Press, New Haven. Brown, Sally, Robert Nicholls, Athanasios Vafeidis, Jochen Hinkel and Paul Watkiss, 2011: The Impacts and Economic Costs of Sea-Level Rise in Europe and the Costs and Benefits of Adaptation. Summary of Results from the EC RTD ClimateCost Project. In Watkiss, P. (Editor), 2011. The ClimateCost Project. Final Report. Volume 1: Europe. Published by the Stockholm Environment Institute, Sweden, 2011. ISBN 978-91-86125-35-6. Lewandowsky, Stephan , James S. Risbey, Michael Smithson, Ben R. Newell, John Hunter, 2014: Scientific uncertainty and climate change: Part I. Uncertainty and unabated emissions. Climatic Change, 124, pp. 21–37, doi: 10.1007/s10584-014-1082-7. Tomassini, L., R. Knutti, G.-K. Plattner, D.P. van Vuuren, T.F. Stocker, R.B. Howarth and M.E. Borsuk, 2010: Uncertainty and risk in climate projections for the 21st century: comparing mitigation to non-intervention scenarios. Climate Change, 103, pp. 399–422. doi: . Weitzman M.L., 2010a: What is the damages function for global warming and what difference might it make? Climate Change Economics, 1, pp. 57–69, doi: 10.1142/S2010007810000042. Weitzman, M.L., 2010b: GHG Targets as Insurance Against Catastrophic Climate Damages. Mimeo, Department of Economics, Harvard University. * Thanks to Michael Tobis for the foggy road analogy, which he seems to have gotten from [[Stephen Schneider]]. ** Judith Curry speaks of the equilibrium climate sensitivity begin between 0 and 10°C per doubling of CO2. The TCR to ECS ratio peaks at around 0.6, so an ECS of 10°C could be a TCR of 6°C. Since doubling of CO2 is a forcing of 3.7 W/m2 and RCP8.5 is defined as 8.5 W/m2 in 2100, that would mean a warming of 8.5/3.7 x 6 = 13°C (Thank you ATTP). For comparison, the IPCC estimates the climate sensitivity to between 1.5 and 4.5°C. Last IPCC report: "Equilibrium climate sensitivity is likely in the range 1.5°C to 4.5°C (high confidence), extremely unlikely less than 1°C (high confidence), and very unlikely greater than 6°C (medium confidence)"
*** Top photo by Paige Jarreau.